I’ve had a pencil in my hand as far back as I can remember, and a drawing of a horse was usually the outcome. Growing up, I read every horse book I could get my hands on and was inspired by the beautiful illustrations, especially ones like Walter Farley’s “Black Stallion” series. I have dabbled in many mediums over the years--oil, acrylic, watercolor, airbrush, etc. However, after studying pastels with Lesley Harrison, an internationally-known pastelist whose work I have admired for years, pastel is my medium of choice. Lesley has my eternal gratitude for introducing me to this exciting medium that thrills me like no other. I still enjoy working with graphite pencil, too, because I “cut my artistic teeth” in this medium. It, like pastel, enables me to achieve all the subtleties needed for a portrait that comes alive! In order to take my own reference photos for portraits, I studied photography at the Southeastern Center for the Arts in Atlanta. That began a detour for several years into photography, and those skills help me to recognize photos that will make great portraits and capture the personality of the horse. If time and distance allow, I like shooting my own reference photos because this helps me get a sense of the horse’s unique qualities. Horses are still my favorite subject. I have a fondness for the feathered horse breeds (I get blissfully lost in all that hair! ), but I welcome the opportunity to draw any breed. They’re all beautiful to me. 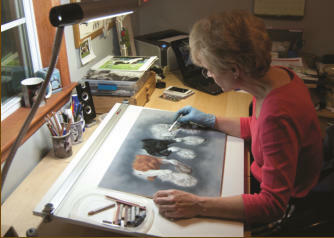 In pastel, I paint with Rembrandt soft pastels, NuPastel hard pastels and Conte pastel pencils. I paint on velour paper mounted on archival foam core board. My husband, Ken, and I live in the suburbs of Atlanta, Georgia. We’re active in our local church and sing on the vocal team. We also enjoy traveling and flower gardening. If you’ve ever known the love of an animal, you know how special they are and how much they enrich our lives. My artistic goal is to showcase the characteristics that make them special and preserve them in a portrait to be enjoyed for years. 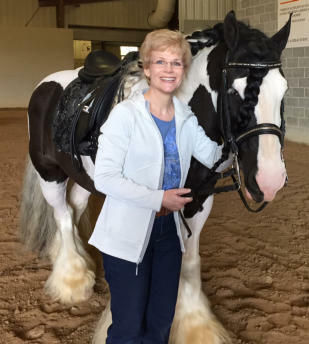 I also hope to help advance recognition of new breeds, like Gypsy Vanner horses, and to encourage people to bring these wonderful creatures into their lives. I hope that owning a piece of my artwork gives you as much joy as it gives to me in bringing it to life!